Your Big, Beautiful Brain is an educational picture book for children written by Reading Monster. What is your brain like? Although it is immensely powerful, it can actually fit in the palms of your hands. But, while small, consider what it can do. You can read whole libraries of books and have your brain retain much of the information contained within. You can create images, play music or see movies within your brain by using your imagination. Your brain transmits data and messages faster than you’d imagine possible, and it controls your senses: sight, hearing, taste, smell and touch. Even while you’re sleeping, your brain is active and working. So what can you do to make your incredible brain even better? Lots of things: read, do math, solve puzzles, draw or even just go out and have fun. Reading Monster’s educational picture book for children, Your Big, Beautiful Brain, introduces the brain and its functions to children, grades k-3, in an entertaining and image-filled format. I marvelled at the actual physical size of the brain and loved the image of it fitting within one’s hands. Reading Monster eloquently shows everyday actions and illustrates how they all come from within the brain. The pictures selected reinforce the message of the story line most powerfully. We see whole libraries, a photograph of the world surrounded by media devices, and a super-fast brain travelling at what seems to be the speed of light. According to the story, the brain absorbs pictures much more efficiently than words, and the images here work very well indeed to help kids learn about this most incredible part of the body. Your Big, Beautiful Brain is suitable for story time as well as for new readers to try on their own. It’s most highly recommended. 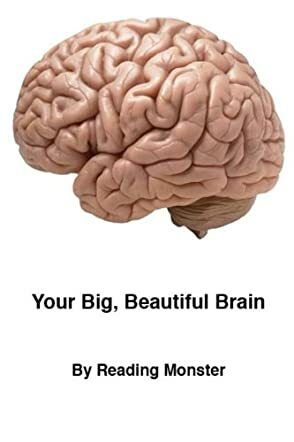 Your Big Beautiful Brain is an informative picture book by Reading Monster that introduces young children to the brain, the most powerful organ in the human body. “Close your eyes. Imagine a flower. What color is it?” Two simple statements that invite investigation and challenge, followed by a simple question – a perfect pairing that introduces young children to brain literacy and the magic that is our brain. As the book so succinctly states, one can make a movie, form a picture or create an orchestra using one’s brain, simply through the power of imagination. Colorful images reinforce the message of the magic that is the brain, along with interesting tidbits of information such as the brain remembering pictures better than hearing new information. In a nutshell, the book contains age-appropriate brain facts along with inspirational mantras about our big, beautiful brains. Reading Monster states that it provides tools for parents and teachers to help develop reading, math and nutritional skills for children and this certainly appears to be the case with Your Big, Beautiful Brain. The author uses simple words, sometimes one or two per page, along with a close-up of a child’s face, to get the point across. On other pages, there is more information provided, along with a jumble of different images, and this serves to underscore all the information and activity going on in our brains at any given moment. The author provides a helpful vocabulary at the end of the book, giving the meaning of unfamiliar words. The pictures are cool and the text age-appropriate in Your Big, Beautiful Brain, giving young readers awareness and the perfect learning tool.